The documentary editor is like a sculptor whose materials are restricted to the format artifacts of media: photography, professionally shot footage, archival material, home movies, interviews, music and transcripts. Today's editors working in the digital realm also have animation, graphics, and effects at their disposal to construct a cinematic story line. But while the equipment to edit documentaries evolves at an ever increasing page - from the steenbeck, Moviola or reel-to-reel video editing system of ten years ago to your average personal computer today - the craft of storytelling remains at the core of editor's work. 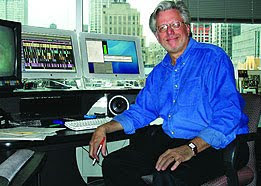 Editor Larry Silk says "Every cut is a disturbance of reality, so the trick is to cut artfully so the cut gives you more than the disturbance it creates", Documentary editing ties together seemingly mundane moments they may lack inherent drama in a way that moves the plot forward, creates intrigue, portrays an engrossing reality, and brings the larger significance of the events to the surface of the film. One of the most common mistakes filmmakers make is they get caught up in how your reveal the exposition. People often begin a film with all the facts, all this background on the characters or on the subject - information that you think the audience needs to know. What you want to try to do is let the story unfold - start with something weird or surprising or wacky or mysterious. There are different philosophies on what that first scene should be, some people like to start with a straight cut interview. I rarely do that - but sometimes it works. If you do start with a talking head, then atleast start at a really unusual point in the interview, to arouse the audience's curiosity. My whole strategy as an editor is to get you on that boat and to go down the river, make it feel like one smooth trip and you're being drawn along. And one thing that can happen is sometimes you'll have two scenes that'll play one after the other - A and B - which, to me, is like getting off the boat, taking a leak on the shore, and then getting back on. its stopping. it's stoppin. So, if you , find a way to intercut those two scenes - and obviously not all scenes can be intercut, there has to be a meaning to the intercutting. But if there is a meaning they can be cut in parallel. Two things happen - one, you are creating one scene rather than two back-to-back scenes. And the other benefit is, you are able to take the best of both scenes - really what you doing is using scene B as a cutaway for scene A, and scene A as a cutaway for scene B. In other words, you get rid of all the crappy stuff in scene A, because you are now in scene B. It is a very standard technique that's invisible to most people. You're drawing the story and it's a very good way to tell the story, through parallel editing. But obviously there's got to be a relationship between the events - that's either got to be a time relationship or there's got to be an emotional relationship of some kind between the two scenes. otherwise it won't work.